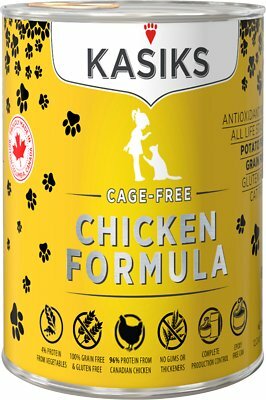 Keep things simple, delicious, and nutritious with the KASIKS Cage-Free Chicken Formula Canned Cat Food. From the family-owned and operated company, the limited-ingredient recipe is specially crafted to nourish your cat. Starting with cage-free chicken to appeal to his protein-loving appetite, the addition of coconut, kale, and berries offer vital antioxidants. The result is complete and balanced diet full of vitamins and minerals that is good for all life stages, and it’s totally free of grain, gluten, and potato. Family-owned and operated company uses state-of-the-art and BPA-free cannery and oversees all production. Coconut, kale, and berries add antioxidants for complete and balanced nutrition, plus vitamins and taurine. Limited-ingredient single-meat recipe is free from gums, thickeners, grain, gluten, and potatoes. Proudly uses cage-free, boneless chicken with no added hormones as the number one ingredient. Uses only the highest-quality ingredients for tasty recipes suited for all life stages. Adult Cat: Feed about 1/2 a can per 8 lbs of body weight per day. I was hoping my 7 cats would like this food since it has good ingredients and I love the larger can but unfortunately they didn't. I mixed it with their other food and still they picked at it and we ended up throwing most of it away. The formula is low ash, which I like but the food looks a little slimy and mushy and not like chicken. Great food. 3 out of 5 cats loved it. One of mine only eats shreds/flakes. They seemed to really gobble it up. My cats might have liked this cat food but almost every can in the case sent to me was very dented which makes me worry about the quality of the food.... Sadly, I cannot feed this to my cats with all of these dented cans. Fantastic ingredients and my cats absolutely love it ! We have 3 cats and have a rotation of anywhere between 2-4 fosters. NO ONE liked this food!! Some cats wouldn't touch it, and others would eat a few bites and then snub it. My one cat who did sort of eat it, broke out a few days after I fed it to her and she eats other grain-free chicken foods just fine. While the ingredients are truly top notch and the price is very reasonable, no one will really eat it. Which has NEVER happened with the sheer number of cats we have- usually someone will like it. Cats lick off gravy and won't eat the food. Am very disappointed, as appears to be good food without all the un-needed ingredients so many other brands contain. This is a very high quality food. It looks just like chicken out of a can, human grade. However, mine did not care for it, they are still wanting to eat their other. Great smelly food for cats. I fed it to my barn cats and they loved it. The indoor ones like a lot of gravy.